Figure 1. An IDP camp at the China-Myanmar border. Source: Author’s own, 2012. ‘Dear Humanitarian Agencies, [the] IDPs regret to let you know that all the humanitarian assistance you provided […] has been abandoned again last night due to the offensive war of [the] Govt Military’. The IDPs referred to internally displaced persons at the border of China and Myanmar, while the ‘Govt Military’ in question was the military arm of the Myanmar government. On 8 November 2015, international news agencies had reported the landslide victory of the political party led by Aung San Suu Kyi. It appeared to herald a new era of democracy in Myanmar. But the civilian government has no oversight over the military, which retains the right to a quarter of the seats in parliament, and power over key ministries to do with defence, home affairs and border affairs. As the Washington Post reports on 28 December 2016, fighting at the border areas of Myanmar has escalated as the Myanmar military intensifies its attacks on ethnic groups it considers insurgents. The IDPs mentioned in the social media post were displaced from their homes in Kachin state (henceforth Kachin IDPs) as a result of armed conflict between the Myanmar military and the Kachin Independence Army (KIA) in Kachin state of northern Myanmar. The breakdown of a ceasefire agreement (1994-2011) between the two parties renewed a civil war in Kachin state. Regional newspapers such as The Irrawaddy provide fuller coverage of the hostilities happening in Kachin state, Myanmar. IDPs who fled further north to the border area that Myanmar shares with China were barred from crossing the border into Chinese territory. This act of refusal in turn prevents the IDPs from being recognised as refugees who have crossed an international border and thereby entitled to protection under international law. For several years following the renewed conflict, local humanitarian workers faced challenges channelling humanitarian aid to the IDP camps at the China-Myanmar border. The remote location of camps at the border area meant the supplies could be delivered only via routes controlled by the military in Myanmar or the government in China. However, both parties denied international humanitarian agencies access to the camps citing sovereignty reasons or concerns over the safety of international personnel in the conflict zone. Only in recent years has advocacy by humanitarian workers succeeded in pressuring the Myanmar military to provide safe passage for the international humanitarian agencies to assess the IDP camps and the needs of the IDPs. Even so, as the social media post above informs us, the humanitarian supplies remain at risk of being destroyed through ongoing conflict. Considering these humanitarian challenges is an article published in Transactions of the Institute of British Geographers which examines the geographical and geopolitical constraints that deter international humanitarian assistance, yet provide opportunities to engage a different set of humanitarian actors at the China-Myanmar border. The paper first argues that the Kachin IDPs are treated as surplus populations by the sovereign states in both Myanmar and China. Surplus populations come into existence when nation-states impose punitive measures that compromise the survivability of populations that are considered threatening to national sovereignty. Second, the paper examines how mobilising affinity ties enables Kachin humanitarian workers to leverage the citizenship resources of empathetic Chinese nationals across the China-Myanmar border for negotiating humanitarianism constraints. Overall, the paper considers how physical and cognitive borders establish taxonomies of social difference but also provide opportunities for identifying connections and forging transversal dialogues (henceforth transversal webs of connections) to bridge people of different social positionings. The paper argues that transversal webs of connections engender affinity ties that can be mobilised towards nurturing empathetic identification and caring relationships in societies characterised by cultural diversity and social complexity. This approach provides a potential ethical stance and productive analytical lens for advancing wider migration and citizenship debates. About the author: Elaine Lynn-Ee Ho is an Associate Professor in the Department of Geography at the National University of Singapore. Elaine’s current research interests include China-Myanmar borderland migrations, Chinese diaspora and transnationalism, Asian forced migration, and urban aspirations of new immigrants in China. This entry was posted in Transactions of the Institute of British Geographers and tagged borders, China, Citizenship, emotions, internally displaced people, Migration, Myanmar on January 16, 2017 by RGS-IBG Managing Editor: Academic Publications. Can new remote sensing technologies improve diplomacy in shared river catchments? By Joseph J. Bailey, University of Nottingham, UK. Rivers are the arteries of the world, carrying life-giving water to the organs that are the natural habitats and human settlements. An increase or decrease in flow can have disastrous consequences through droughts and flooding, thus ensuring a sustainable water supply is seen as a priority by many states worldwide. Despite the vast number of environmental problems dams can (and do) cause, they allow people to not only control water flow to the population in times of low or high supply/demand, but also produce energy through hydroelectric technologies. Whether or not to build a dam, and when to remove a dam, is, or at least should be, decided by comparing the environmental impact with the benefits of energy and water provision. The accumulated impact of building multiple dams within a watershed should also be considered, because this can result in lower water quality for humans, alongside inflated environmental impacts. It is not surprising then that dams are highly contentions across all scales, from the local to the global. Indeed, they are one of the most contentious geopolitical issues in the world today, with international debates surrounding the Nile in Africa and within-country debates over Brazil’s Belo Monte and Madeira dams, to take just two examples. Dams have even been considered ‘powerful weapons of war’ in the Middle East. To sum up, dams are amongst the most important structures in the world because they safeguard the most valuable resource in the world for whoever owns it. Dams therefore hold great political, as well as hydrological, power and are understandably at the centre of many international debates and discussions. Often in such debates and discussions, the owner of the upper reaches of a river, and any dams therein, holds vast amounts data about spatial and temporal water flow (discharge) in that region, and may closely guard those data from its neighbours, and from global data hubs. Those who hold the data have a political advantage when discussing the future for a particular river, and those downstream, who possess no or very little data on the upstream parts of the river flowing through their country, may struggle to apply any political pressure. This issue of data sharing, or lack thereof, is discussed in a paper by Gleason and Hamdan (2015) in The Geographical Journal. They write how a novel remote sensing technique might be able to help with this using two case studies: the Brahmaputra and the Mekong (known as the Lancang in China). Both have featured in the news recently, with the opening of a Chinese dam in the upper reaches of the Brahmaputra in Tibet (e.g. Reuters Africa, Voice of America) and with the Mekong because of the many dam constructions completed recently or in progress (map and details at International Rivers; also see Al Jazeera). Both of these situations are very complicated, affecting millions of people in the countries concerned, as well as attracting international attention. The aforementioned technique highlighted by Gleason and Hamdan (2015), and initially developed by Gleason and Smith (2014), is called ‘at-many-stations hydraulic geometry’ (AMHG). It uses remotely sensed data (from satellites) and recent advancements in geomorphic theory and aims to address the data shortfall many countries experience in relation to inaccessible watersheds. These are usually in another country, but the technique may also be of use in hard-to-reach areas within a country. While the model produces noteworthy inaccuracies compared to in situ gauge measurements, these data are obtainable by anyone and may at least partially fill a knowledge gap for some countries. Perhaps through enabling countries without direct access to flow rate information of river stretches outside of their borders, data from remote sensing technologies will benefit a nation’s diplomatic standing with their neighbours. Such technologies are also likely to improve in the future with dedicated satellites for measuring river properties (see Gleason and Hamdan, 2015). This will overcome inaccuracies seen with AMHG, which, at present, may be an argument that countries owning upper reaches can use against those further downstream; that the data being used are not accurate enough to make a valid case for more or less water to be released downstream, for example. However, whilst these new technologies will no doubt be able to assist with hydrological monitoring into the future and probably help with these often tense cross-border situations by enabling downstream countries, the ultimate challenges, as is already the case in many places at the moment, will be political and rely on the relationship between the countries concerned. This is because one country will always control the dam that stops and releases the water, even if their neighbour knows absolutely everything about the watershed concerned through remote sensing. There are many discussions to be had about who really owns rivers, containing arguably the most valuable resource on the planet, when they start in one country and flow into another. As climate change continues, and populations grow, water resources are likely to be stretched ever further and it may be prudent to attempt to resolve the issues discussed here sooner rather than later. Gleason C. J. and Smith L. C. (2014). Toward global mapping of river discharge using satellite images and at-many-stations hydraulic geometry. Proceedings of the National Academy of Sciences, 111, 4788–91. Gleason, C. J. and Hamdan, A. N. (2015). Crossing the (Watershed) Divide: Satellite Data and the Changing Politics of International River Basins. The Geographical Journal (early view). This entry was posted in The Geographical Journal and tagged Asia, Bangladesh, Brahmaputra, China, Climate change, dam, Earth Observation, Environment and Society, Geopolitics, hydroelectricity, Hydrology and Water Resources, Mekong, Remote sensing, river on October 26, 2015 by J Bailey. This issue of Area also officially announces the 2014 Area Prize recipient . Part of Area’s mission is to be accessible to new researchers, including postgraduate students and academics at an early stage in their careers. The purpose of the Area Prize is to encourage submissions from new researchers and to reward excellent geographical research. The winner receives a cash prize of £500. The field of eligible papers were of a very high quality. This year, the prize was awarded to Rory Horner (University of Manchester) for his paper ‘Postgraduate encounters with sub-disciplinary divides: entering the economic/development geography trading zone’ (Area 46 435–442). Rory’s paper is free to access for the next 12 months. Honourable mentions go to Hannah M Chiswell (University of Exeter, UK) for ‘The value of the 1941–1943 National Farm Survey as a method for engagement with farmers in contemporary research’ (Area 46 426–434) and Saskia Warren (University of Manchester, UK) for ‘ “I want this place to thrive”: volunteering, co-production and creative labour’ (open access) (Area 46 278–284). 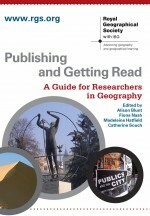 To find out more about the Area Prize, visit the journal’s Wiley Online Library. 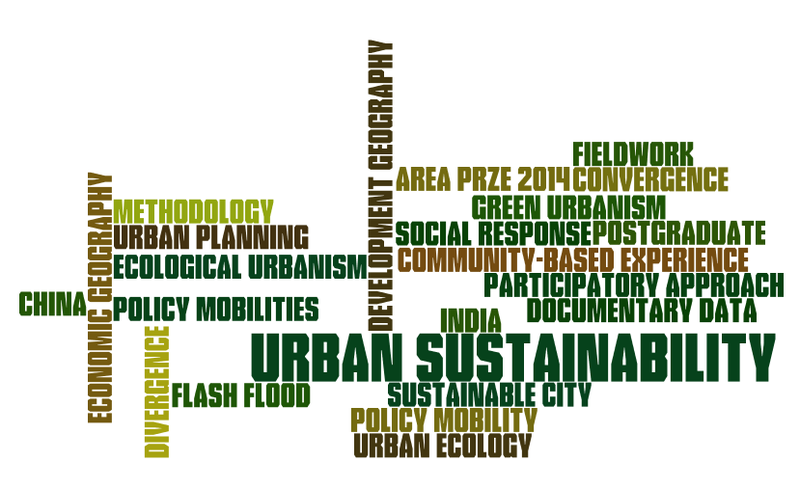 This entry was posted in Announcements, Area, Area Prize and tagged Area prize, China, flash floods, new issue, participatory responses, sustainable city, urban ecology on April 20, 2015 by RGS-IBG Managing Editor: Academic Publications. On 18th October 2014, thousands of people took to the streets of London for a mass demonstration, arguing that “Britain Needs a Pay Rise” (BBC News, 2014). In their 2008 report for the Institute for Public Policy Research, Working out of Poverty, Lawton and Cooke found that, for the first time, more people in work are below the poverty line than those out of work. A report by The Resolution Foundation, Low Pay Britain 2014, states that as many as 1 in 5 workers or 5.2 million people earn less than than £7.70 an hour. Last year, the number of people in low-paid work (defined as less than two thirds of median hourly pay) rose by 250,000. Wills and Linneker, writing in Transactions of the Institute of British Geographers in 2014, describe a living wage as one that reflects the local cost of living and the real cost of life. It is an instrument of pre-distribution, rather than using the state’s mechanisms to re-distribute wealth as a way of alleviating in-work poverty. Wilkinson and Pickett (2010) argue that Governments would be better advised to minimise the production of inequality to start with, rather than spending billions of pounds in welfare initiatives to ‘mop-up’ after the party. Wills and Linneker write that in the UK, the living wage campaign has targeted both private and public sector employers, and the campaign is gaining pace. The Greater London Authority (GLA) has applied the living wage across its own supply chain to include the Metropolitan Police Authority, the London Fire Brigade and Transport for London. The Living Wage Foundation has been pivotal in deepening the impact and spreading the demand of the campaign through the participation of a wide coalition of champions, including Trust for London, Save the Children, Queen Mary, University of London, KPMG and Linklaters. Flint et al. (2014), writing in the Journal of Public Health, find significant differences in psychological wellbeing between those who did, and didn’t, work for London Living Wage employers. Recent figures show that the campaign has a long way to go. Wills and Linneker argue that, “in the context of a Conservative-led coalition government, along with on-going economic malaise and a weak trade union movement, the demand for a living wage probably represents the best route to reducing the extent and impact of in-work poverty, and ultimately, the degree of inequality within the UK” (2014: 187-188). By taking on a geographical perspective, the authors find that the living wage is a spatial intervention, which attempts to set a new moral minimum for wages across a labour market in a particular locality. They highlight how the impact of the living wage at one scale is very different to that experienced at other dimensions, and this shapes the arguments to be used in its defence. The living wage also raises important questions for geographers seeking to understand poverty and its potential solutions, as it can “put the scourge of economic injustice and inequality at the heart of political campaigning at all spatial scales” (2014: 192). K. Lawton and G. Cooke 2008. Working Out of Poverty: A study of the low-paid and the ‘working poor.’ Institute for Public Policy Research. J. Wills and B. Linneker 2014. In-work poverty and the living wage in the United Kingdom: a geographical perspective. Transactions of the Institute of British Geographers. 39 (2): 182–194. doi: 10.1111/tran.12020. This entry was posted in Geography Compass and tagged carbon emissions, China, Climate change, Economic development, economic growth, economy, growth, international co-operation, low carbon, low carbon technologies, sustainable development, UN Climate Change meeting on November 5, 2014 by izabeladelabre. On the eve of the UN Climate Summit in New York on 23 September, the city saw an estimated 400,000 people take to the streets in the largest climate change march in history. Marchers gathered in cities across the world to call for ambitious action on climate change policy: 40,000 in London, and 30,000 in Melbourne. In Tanzania, the Maasai marched across their traditional lands to draw attention to the protection of their homelands in the Serengeti from climate change impacts. 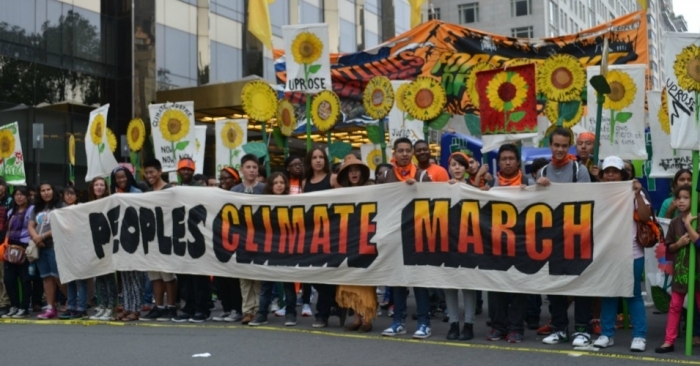 These marches indicated the public’s frustration of political failure to reach, and implement, effective climate deals, and this anxiety is compounded by stark warnings from the academic community. In Nature Geoscience, Friedlingstein et al. (2014) write that global CO2 emissions from fossil fuel combustion and cement production have, on average, grown by 2.5% per year over the past decade. Two thirds of the CO2 emission quota consistent with a 2°C temperature limit has already been used, and it is predicted that the total quota will likely be exhausted 30 years from now, using 2014 emissions rates. Friedlingstein et al. find that carbon intensity improvements of emerging economies have been lower than anticipated, and warn that without more strict mitigation measures, these trends will continue. Therefore, they stress, a break in current emission trends is urgently needed in the short term, to keep within the 2°C temperature limit. The Global Carbon Budget 2014 found the top five CO2 emitters to be China, USA, EU, India and the Russian Federation. In a BBC article, Professor Corinne Le Quéré from the University of East Anglia stated that a significant proportion of China’s emissions were driven by demand from consumers in Europe and the USA: “In China, about 20% of their emissions are for producing clothes, furniture even solar panels that are shipped to Europe and America.” Writing in Geography Compass in 2008, Kaplinsky stated that the distribution of income in China moved from being one of the world’s most equal to one of the world’s most unequal economies in a couple of decades. Kaplinsky argued that China and other Asian emerging economies must be included in discussions of global governance. Six years later, during this week’s Climate Summit, China for first time pledged to take action on climate, with the aim for reducing its emissions of carbon per unit of GDP by 45% by 2020. Given the impacts of globalization on climate, poverty, and inequality, and considering the scale of the impacts of climate change, the report New Climate Economy: Better Growth, Better Climate puts forward areas in which international co-operation has the potential to make a significant impact on the prospects for low-carbon and climate-resilient growth, as well as a ten-point action plan. The report states that national economic policies will need to be significantly revised in the next 15 years, when the global economy is expected to grow by more than half. On the day of the report’s release, President Obama tweeted, “This study concludes that no one has to choose between fighting climate change and growing the economy”. R. Kaplinsky 2008. Globalisation, Inequality and Climate Change: What Difference Does China Make? Geography Compass 2(1): 67–78. C. Le Quéré, R. Moriarty, R. M. Andrew, G. P. Peters, P. Ciais, P. Friedlingstein, S. D. Jones, S. Sitch, P. Tans et al. 2014. Global carbon budget 2014 Earth Systems Science Data. Discussion Paper, 7: 521-610. Above is an excerpt from the article, A Tea From the Jungle Enriches a Placid Village, by Thomas Fuller of The New York Times. It discloses a juxtaposition of both “ancientness” and “fashion” of Pu’er tea, a tea produced on China’s southwest frontier. This juxtaposition, in fact, conveys current dilemma regarding development on the frontier. Frontier (bianjiang) carries the connotation of ‘backwardness’ (luohou) in China. On China’s frontier, including southwest China, this connotation of ‘backwardness’ applies not only to the physical frontier landscape, but also to the people, especially China’s ‘minority nationalities’ (shaoshu minzu). China’s southwest frontier, paradoxically, also denotes a place where pristine nature is well-preserved due to its lack of modern development. As a result, frontier landscape becomes the material form of ‘unpolluted’ nature, where the minority nationalities live harmoniously with their ‘primitive’ lifestyles without damaging their environment. The paradoxical meanings of landscape on China’s southwest frontier, being ‘backward’ as well as being ‘natural,’ have situated development on China’s southwest frontier in dilemma. On one hand, development seems imperative to counter the prevalent ‘backwardness’ in southwest China. On the other hand, development seems threatening in terms of its potential to destroy the landscape of pristine nature on the frontier. Primitive nature and modernized development become two incompatible desires coexisting on China’s southwest frontier. In a paper published in Area, I use tea production on China’s southwest frontier as an example to demonstrate that dilemma is not an end result, but a mechanism to rearticulate the relationship among frontier, the state, and the market economy. Data are based on ethnographic research in the village of Mangjing. Mangjing is located in Jingmai Mountain (Jingmaishan), a renowned tea mountain in Yunnan, a province on China’s southwest frontier. Most of the villagers in Mangjing are one of the minority nationalities of China, Bulang (or Blang). 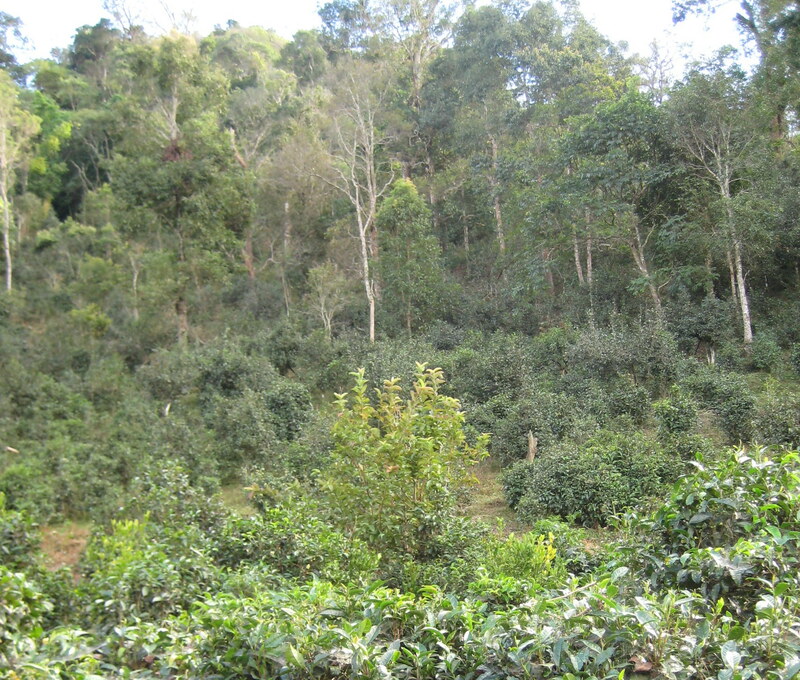 Specifically, I discuss the state-led project in transforming the modern tea plantation to “restore” a landscape deemed as “ancient tea forest” (guchalin) or “ancient tea arboretum” (guchayuan). In Mangjing, the ancient tea forest was considered by the state as form of backward culture and lagging-behind economy. As a result, many ancient tea trees were clear-cut for planting either the “modern” terrace tea (taidi cha) or other crops. Nowadays, the growing market of ancient tree tea, in turn, has substantially created new economic, cultural, and political values of ancient tea forest. In consequence, the state, ironically, has launched a restoration project to bring back the missing ancient tea forest. Looking into the tea story in Mangjing, I found that dilemmas on China’s southwest frontier have been forged by the Chinese state with its incompatible desires between “modernization” and “primitiveness” of the tea landscapes in Yunnan. Meanwhile, the incompatible desires and the resulting dilemmas on China’s southwest frontier have further mobilized the state to flexibly rework its power to reconstruct the frontier to meet contingent market demand. Based on the shifting meanings of tea landscapes, the state has flexibly “shuttled through” the dilemmas between development of modernization and preservation of primitiveness on the frontier. About the author: Po-Yi Hung is an Assistant Professor in Geography at the National Taiwan University. This entry was posted in Area, Early View and tagged China, frontier, modernisation, primitiveness, tea, Yunnan on September 9, 2014 by RGS-IBG Managing Editor: Academic Publications. From “overstocking” to “overgrazing”: more livestock as a symbol of wealth? In 2011 China, which claims to have the world’s second largest grassland area after Australia, launched its largest grassland protection program literally known as the grassland ecological protection subsidy and reward mechanism in its pastoral region. The backbone of the program is to subsidise or reward pastoralists for not “overgrazing”. Nonetheless, it is hard to celebrate this new program as progress on grassland management and pastoralism because it is merely the latest example of an underlying assumption deeply embedded in state policy on grassland management and pastoralism in China. In China overgrazing has long been assumed to be a direct or main cause of grassland degradation. Accordingly, adjusting livestock numbers to “carrying capacity” has been both a means and a goal of protecting grassland ecosystems. Pastoralists have often been accused of overstocking because they are believed to want to raise more livestock as a symbol of wealth. Through a case study from Nagchu Prefecture, the largest pastoral prefecture on the Tibetan Plateau in terms of both grassland area and livestock numbers, in the Tibet Autonomous Region, which is reported to have the largest grassland area in China, my Area paper raises the questions whether more livestock are a symbol of wealth for pastoralists and why pastoralists appear to raise more livestock than they currently appear to need. My research in Nagchu shows that pastoralists do not raise more livestock as a symbol of wealth. Instead, three overlapping reasons explain why pastoralists want to raise more livestock than they currently appear to need. First, owing to biological, cultural and economic factors, current livestock numbers are not equivalent to actual livestock available for production. Second, pastoralists want to raise more livestock as a long-term strategy for livelihood security and flexibility. Third, pastoralists want to raise more livestock as a means for improving their standard of living. Therefore, for pastoralists raising more livestock is a means rather than an end. My Area paper also shows that in practice, labor power, grassland and economic status are three primary overlapping factors constraining pastoralists from raising more livestock. A take-home message for policy advisors and policymakers from my Area paper is that pastoralism must be understood from the standpoint of pastoralists and in the socioeconomic, cultural and environmental context in which pastoralist live, rather than from outsider perspectives and values. 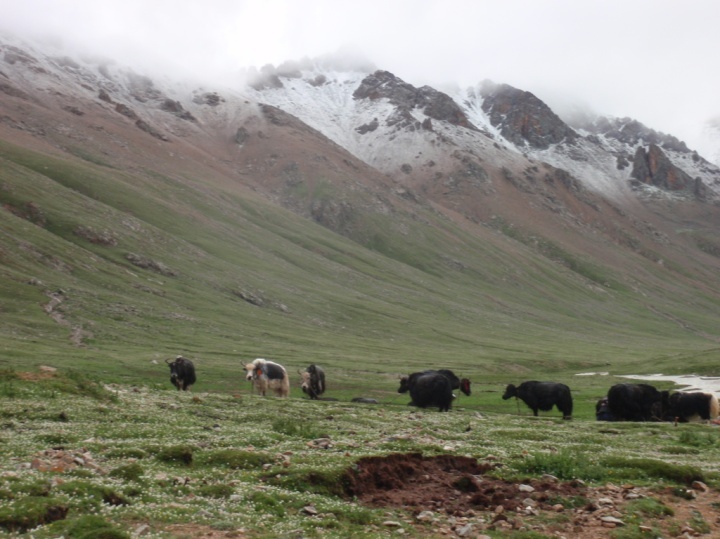 This entry was posted in Area and tagged cattle complex, China, Cultural Geography, Economic Geography, herd size, pastoralism, qualitative interviewing, Tibet on June 30, 2014 by RGS-IBG Managing Editor: Academic Publications.